How Much Are Mortgage Closing Costs? Good news for this year’s mortgage borrowers — not only are current mortgage rates below their year-ago levels, but mortgage closing costs have climbed only slightly. According to Bankrate.com’s annual Closing Cost Survey, mortgage lenders are charging just 1.6 percent more, on average, to close on a loan this year as compared to 2015; which was 7% lower than from 2014. Lower closing costs for home buyers and refinancing households means that less money is required at closing, which makes it easier to get mortgage-qualified all around. Lower costs also means it’s easier to get into homeownership. So, how much are mortgage closing costs? It actually depends on where you live. Some states are expensive, and some states are cheap. This year’s Bankrate.com Mortgage Closing Cost Survey uncovers some interesting trends. Mortgage borrowers are paying less 1.6% more to lenders this year, which is just above the national rate of inflation, according to Bankrate.com’s annual Mortgage Closing Cost survey. Lender closing costs now average $1,058 per loan as compared to $1,041 one year ago. “Closing costs” are fees which would not be payable if a home was financed with cash. They include origination fees charged by lenders, among other fees; plus, the cost of appraisals and home inspection services. The small increase is notable because it suggests that banks are getting better at handling new layers of federal regulation and required loan standards. Lenders are streamlining their loan processes, and passing those savings on to U.S. consumers. The survey, which assumes a purchase-money transaction and a FICO score of 740 or better, includes mortgages for all loan types including FHA loans, VA loans, USDA loans, and conventional loans via Fannie Mae or Freddie Mac. Jumbo loans are excluded from the survey because by definition, jumbo loans exceed the national conforming loan limit of $424,100; or, $636,150 in such “high-cost” areas as Los Angeles, California and Montgomery County, Maryland. Bankrate.com’s survey is based on loans of $200,000. Survey results exclude title insurance fees, taxes, and prepaid items, which vary by state. What you pay in closing costs will be determined by where you live. In some states, mortgage closing costs are high. 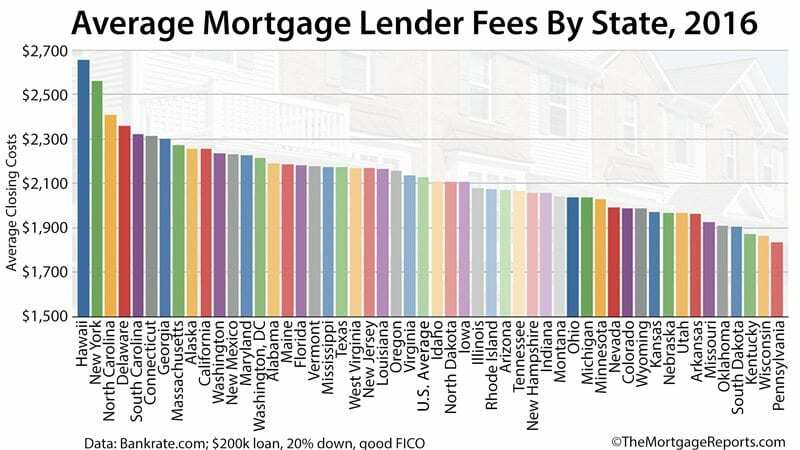 In other states, mortgage closing costs are low. For example, in Florida, all mortgage transactions are subject to tax. In Colorado, none are. As a result, closing costs in Miami are typically higher than closing costs in Denver. And, in Chicago, Illinois, only purchase transactions are taxed, which adds to your total costs at closing. Additionally, closing costs will vary based on your lender. Origination fees vary between banks — sometimes by a lot — and this is the number one reason why you should always get multiple quotes when shopping for a loan. Your savings could be twenty percent or more on your fees. Putting dollar amounts to percentages, borrowers in Hawaii, therefore, can expect to pay lender fees equal to about 1.32% on their $200,000 loan. In New York, borrowers can expect to pay 1.28%. Nationwide, lender closing costs average $2,128, or 1.06%, of the borrowed amount. Want To Pay Fewer Closing Costs? Even though mortgage closing costs are just slightly higher as compared to a year ago, they can still affect your budget. Depending on your loan size, your individual charges may range as high as $4,000 — and that’s before you consider fees paid for title insurance, transfer taxes, and settlement. Thankfully, you have a way to reduce or waive your loan closing costs completely. To get a loan with reduced or waived costs, at the time of your rate quote, ask the bank if they’ll also give you an accompanying “low-cost” quote, and maybe a “zero-cost” quote, too. Many mortgage lenders are happy to provide such options. Here’s how they work. When you do a low-cost or no-cost mortgage, you are willingly accepting a higher mortgage rate than the “market rate” in exchange for having some or all of your loan fees waived. In general, on a $200,000 loan, an increase to your loan rate of 12.5 basis points (0.125%) will convert your loan to a low-cost loan; and, an increase to your loan rate of 25 basis points (0.250%) will convert your loan to a zero-cost loan. As an illustration, let’s assume that today’s going mortgage rate is 3.25% and that your closing costs, inclusive of title charges, total $3,000. Which choice is best? That depends on your preference. For many people, the zero-cost loan at 3.50 percent feels best. Why pay closing costs if you don’t have to, after all? For others, though, the choice will be different. How you structure your loan is 100% your choice. Be sure to ask a lender for all of your personal options. Closing costs are falling, and mortgage rates are low. If you’re buying a home or refinancing one, consider all of your closing cost options and choose the loan that best fits your needs.